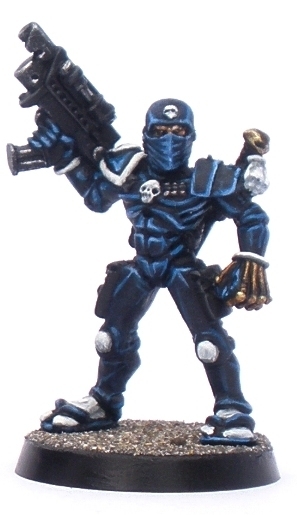 Assassins have been part of the WH40K universe since the original “Rogue Trader” edition. In the numerous background sources produced since then many of the various elements that made up the Assassin as described in that original rulebook were split up into six aspects of the Officio Assassinorum. This gave rise to six different assassin “temples” or “clades”, each with their own equipment and techniques. To date corresponding miniatures have been made for four of the six temples. 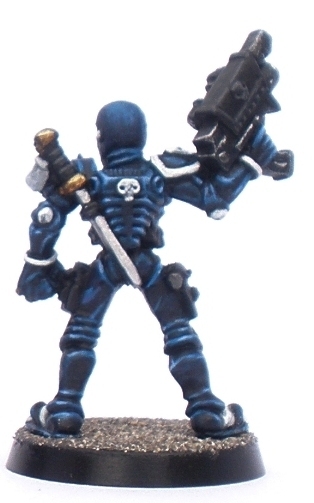 Before all of that however Jes Goodwin sculpted this more generic assassin figure to fit with the background in Rogue Trader. It is to my mind a stone cold classic GW figure. Elements of the design of this model were carried forward to each of the miniatures for the four assassin temples. While those later assassin models are largely pretty good, none of them have the charm of this figure. Assassins are pretty much invariably painted black, ninja style. I have painted a lot of black on miniatures recently so I wanted to steer clear of that on this one. I came across a photo of the figure painted in a light blue scheme somewhere online (I cant remember where) and while the blue was great, what really caught my eye was the white socks. Apart from what I have picked up from trash like Power Rangers over the years I know very little about samurai and ninja fashions and styles, but to me the white socks were evocative and pretty cool. So I loosely copied the colour scheme that I saw online, with a few minor changes that suited me. Lastly, this figure was painted after a long break in painting which shows in a few places. When I look at it I vaguely remember a comment about “the lack confidence in the brushstrokes” that I remember an old college tutor making. I think that that applies to this figure: it would have benefited from more precision painting. On the plus side, I think that the figure looks cool anyway, even if some of the highlighting is a bit clunky. I am considering picking up the four figures from each of the various Officio Assassinorum temples and making a team, each painted in a tonally dark but brightly hued colour, Power Rangers style. It might even happen too, as it would be a pretty quick project plus I have wanted something to serve as Power Rangers in miniature for a while now. While the gun is a tad largeish, the miniature as a whole is great and very nicely painted too! Proper highlighting is for nerds and geeks, us real proper men highlight our toysoldiers every which way! I love the sandal look with white socks very nice indeed. I concur with Mattias above, the gun looks DARN big for him. The model itself has a charm though. The gun is pretty big. Thats what happens when tech-priests stick needlers to bolt pistols I suppose. I really do like the figure though. I think that the painting worked best on the rear of the model, the slightly insectile looking backpack came out pleasingly. His abs look rock hard too now that I look at them. I have been looking for suitable miniatures to paint up as Rangers for many years now, but had no luck. Using 40k Assassin figures as proxies will hopefully kill two birds with one stone. Nice mini with loads of charm, supported by a solid paintjob! Have you read the Horus Heresy book Nemesis? It focuses on a band of clade assassins that are sent to bring down Horus. Well worth a read if you haven’t already! I have a copy of Nemesis at home (I think) but I havent got as far as that in the HH series yet (not that the order matters really once the first three books are done with). The last HH book that I read was Mechanicum (which is a not so subtle hint regarding another project that I have been working on). I might bump Nemesis up the queue on your recommendation in an effort to enthusiastically fast track this micro-project. As ever I appreciate the feedback.